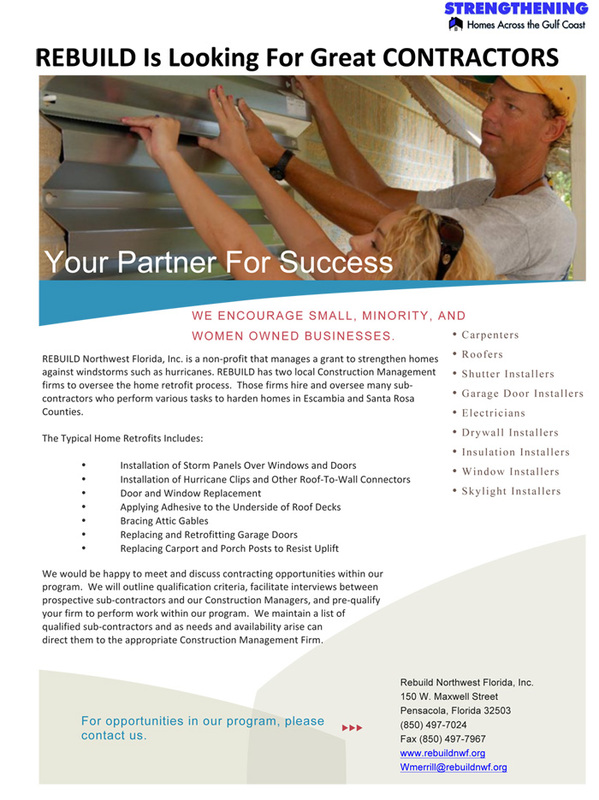 REBUILD Northwest Florida is a not-for-profit 501(c)(3) organization that was established in 2004 by a group of individuals to help the community recover from Hurricane Ivan. The organization continues to strengthen Gulf Coast communities by helping to fortify homes against hurricane storm damage. Apply Now! Either call 850-497-7024 OR submit an online inquiry for more details on how to apply. LIMITED FUNDING HAS BECOME AVAILABLE FOR ESCAMBIA COUNTY. DO NOT DELAY- CONTACT US TODAY! Click to download the request for proposal. Click the link above, and fill out the form on the following page. Someone from REBUILD will contact you to verify eligibility.